Roland Prevost has been published by Arc Poetry Magazine, Descant, The Toronto Quarterly, Dusie, Ottawa Arts Review, among many others. He has four chapbooks: Metafizz (Bywords, 2007), Dragon Verses (Dusty Owl, 2009), Our/ Are Carried Invisibles (above/ground press, 2009), and Parapagus (above/ground press, 2012). He won the 2006 John Newlove Poetry Award. His first trade poetry collection, Singular Plurals (Chaudiere Books), appeared in September, 2014. He lives and writes in Ottawa. His piece “Oh, to What Feeds” appears in the third issue of Touch the Donkey. Q: What is your relationship to the poetic fragment? Depends on the fragment. But in general, I see such fragments as an opportunity to keep the writing ball in play. They stimulate my imagination. I can extemporize 'off' a fragment, sort of like a jazzist can riff off a bass progression, say. Even if keeping the same bass, there are almost endless spontaneous jam arrangements possible. There's a sense in which poetic fragments have a holographic nature. By this, I mean that a poetic fragment still contains a version of something larger than itself, much like a small section of a holographic plate still contains the whole 3D image, just less sharply defined. I sometimes like to take fragments from other sources, from the writings of others, my own writings, or even short passages of entirely made-up literature that I then build into poems of their own. For an example of the latter, see the long poem Hat_Pulse (Singular Plurals (Chaudiere Books, 2014)). Starting from the other end of the spectrum, I sometimes write pieces that seem whole and complete, but whose texts take on additional meanings when woven into the larger context of a chapbook, or book of poetry, or possibly even a life's work. I'd like to imagine that the same holographic principles apply, and that this wider meaning of a poem in a new context was somehow enfolded in it, all along. A: It’s nearly impossible to be aware of all the antecedents to a poem. So, we adopt a kind of a fiction and name the most likely sources. A second side effect of going through that condition has been a palpable increase in feeling “glad to be alive”: a strong realization that I should not take life for granted. This causes a general opening up in a person, which is also an emotional undercurrent of this poem. So many folks helped me get through this challenge that I also got a strong impression of community, and of our being in this thing together. This third emotional thread finds expression in the text as well. There are many examples for each of these emotional veins in the poem, but these quotes should be enough to show the connections. As for the style of this poem: for decades, when the subject calls for it, I've adopted what I’ve called ‘tight-form writing’. Roughly this results in a kind of telegraphic, shorter version of English. When this text tightness gets applied along aesthetic lines, this results in the type of poetic grammar seen here. It fits the emotional content of the poem in that it praises each individual breath. Q: What is it about the “telegraphic, shorter version of English” that appeals? A: Telegraphic or as I now refer to it “tight-writing” developed first while taking notes, as a way of dealing with motor-mouth lecturing professors when I first arrived at University. It seemed impossible for me to catch every sentence they uttered, and tape recording their lectures for later transcription more than tripled the amount of work. So I quickly had to develop a very condensed way of taking notes in order to come close to keeping up with the knowledge stream. Hubble thought: classification system, mistake. Big Bang Theory – correlates to Universe expanding. Relativity meant: static Universe impossible. Not long after, in the pages of my logbook, I noticed that certain awareness-based experiences were also overloading my capacity to write, if I tried to transcribe them live. As with the University notes, there was simply too much happening all-at-once for me to catch any meaningful percentage of it in ink. So I adapted my note-taking way of writing for ‘live stream capture' in my logbook. I noticed there was quite an important difference with these ‘live in the moment’ texts, with a particular advantage in capturing the core of an experience. Tight-writing had been adapted to logbook writing, in other words, for those cases where I wanted to capture experiences in the stream as they flowed. Must drop soul-garbage. Detritus. Past does not bind. Accept. Answerless in world of changes. Can be done. As inside, so outside. Pile of fragments, not EZ. At a much later time, when writing poetry, I had to try to capture my picture-imagination. I once again had to find a way to catch very fast - almost kaleidoscopic - image changes, in text. There were many more tweaks and adaptations required this time, since there were many aesthetic considerations to maintain. However, I began to associate this condensed form of writing with imagination. Even when later editing my ‘pixmind stream captures', I tended to keep these pared down tighter sentence fragments, their focused attention to unadorned details. That’s the genesis of my use of a ‘tight-writing’ aesthetic in poetry. We are reduced to call upon the eye and ear. Dicephalic Parapagus: one body, two heads. Their locked proximity, a theft of each other's lives. Suggests an acceptance of strangeness. At the root of meanings: like humane, or superstitious. Speculations too easy. These painless imaginings. Guards protect the site. Day and night shifts. From a global Fame to beat Lucy’s bones. This same style was also applied to "Oh, to What Feeds." It seems to fit the immediacy and intensity of the emotions expressed there. Q: You seem to have developed a comfortable degree of writerly instincts. I know you’ve been working on a daily “log book” over the years, where first drafts of much of your work emerges. How does the daily practice of composing your “log book” translate into finished pieces? Do you consider yourself a writer of poetry, or a writer of a “log book,” some of which might be carved out and reworked for the purposes of publication? A: My successful logbook journey began at the age of 15, after half a dozen failed attempts to keep a daily journal. Somehow on this particular try, the habit finally took hold. If I were to guess at what made the difference, I’d say it was a sense of exploration. A huge drive to understand the world, this life, and awareness. Though the logbook contained many rough drafts of works of fiction, short plays, short stories or poems, these for many years took a back seat to working out insights, discoveries, and understandings. The creative writings were a means to an exploratory end. Their texts were probes, existential experiments, and not aesthetically meant for public consumption. At around age 45, that is after 30 years of this, I felt like I'd gotten a decent preliminary look around. Also, along my travels and explorations, I’d discovered that the concept of human culture had taken on a growing importance for me. For the first time, I felt I could and perhaps should give priority to creative work. I've always considered myself an explorer first. Trying to map out what was mappable, and beyond that, trying to encapsulate what was meaningful in a multitude of other ways. As such, all writing consists of a single thing, for me. Logbook, emails, essays, songs, stories, and poems. All of them: instances of bearing witness in some way or other. It's not exactly that I consider myself a logbook-writer who then catches certain parts to craft them into poems. It's a bit wider than that. I've been an explorer all along, and only some of these explorations end up in written works of various kinds. Some of them in logbook pages, and more recently, others in poems, depending on the subjects and treatments desired. The main difference between the logbook and a poem is that, whereas they both share my drive to “encapsulate meaningful awareness-tunings,” with poems, I'm trying to do so in an aesthetic medium, and sometimes also, for the purpose of placing the work on River for a potential eventual re-animation by others. Everything goes into everything else, when it comes to writing. Explorations into ink, and ink into a myriad of forms, including logbook and poetry. In actual fact, in a human mind, everything seems to interact anyways. Might as well put that into one's design for being, and therefore also, for writing. Seems to me. Q: You make it sound as though you came to poetry and the use of the poem-fragment rather organically, and yet, I know you’ve done an enormous amount of contemporary reading of poetry. Over the years, what writers and works have influenced the way you approach a poem? Who have you been reading more recently that have had an influence on the way you work? A: Over my entire lifetime, there’ve been quite a few poets of influence I guess. But of particular note “over the years” would be: e.e.cummings for his willingness to play with and re-invent grammar, Charles Olson for his attention to the percussive nature of poetry, Jack Kerouac for his freedom and awesome poetic travelogues, Irving Layton for his in-your-face uninhibited attitude, bpnichol for the sheer fun of word shapes and sounds, Leonard Cohen for the clear and powerful vision of his songs, Robert Creeley for his willingness to kick holes through our typical boxes, William Carlos Williams for the sculpted power and simplicity of his words, T.S.Elliot for the wide modernist grandness of his sight, Margaret Atwood for her mean-but-true fishhook barb end twists, and Robert Kroetsch for his organic experiments with creating better vehicles blending sound and meaning with form. These, off the top of my head, would probably represent my main writing influences, lifelong. As for more recently, the poets who are clearly influencing me at the writing chair in practical ways: Gil McElroy for his always inspiring and ongoing Julian Days series of poems, Dionne Brand for the mysterious tone of her book Ossuairies, Mary Jo Bang for her seminal mix of grammar and emotion in her poem The Opening, Monty Reid for his ability to find the perfect distance while providing rich multi-levelled perceptions in The Luskville Reductions, anything by Margaret Avison (whom I’m re-reading) for the sheer spark and fresh/gentle wildness of her sensibilities, and rob mclennan for his ongoing willingness to show us finer details, yet still let them speak for themselves. This list of active present influences keeps changing all the time, but this represents my present roster. Q: How do you feel the poem “Oh, to What Feeds” fits into, or even expands, the rest of your writing? And now that you’ve a first trade collection under your belt, as well as a small handful of chapbooks, where do you see your writing headed? What do you feel you might be working towards? A: There’s been a progression, to be sure. A gradual re-working of voice and tone, coupled with a paring down of considerations. I’d describe it as a shorter distance between awareness and text. 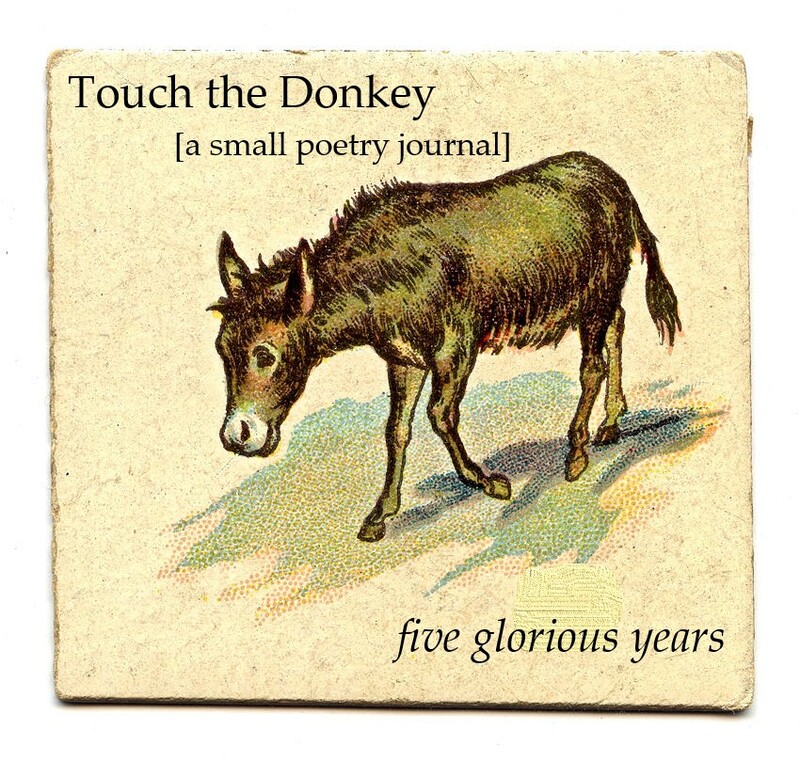 I’ve written a few poems recently that have this character: “Oh, to What Feeds” (Touch the Donkey #3, October 2014), “We Verb Nature” (Dusie, expected online Nov 2014), and “Knack to Promise” (Chaudiere Books, National Poetry Month, April 2014) represent three examples of such works. That’s where my writing’s going, stylistically. As I’ve written elsewhere, with poetry I’m trying “to create and encapsulate meaningful awareness tunings in aesthetic language, for later re-animation by a future self or others down River.” At the writing chair, I’m attempting to increase clarity, while still “enshrining the mystery.” I’m more aware of eyes and ears other than my own, and I'm starting to feel the writing implications of this. As an activity, I increasingly see poetry as much more than a transcription of what’s already perceived. Instead, it’s an actual forging of awareness, somehow improving it, making it more rich, increasing its reach, titrating its possibilities. In other words, adding new windows to my dwelling-place. This feels more fully aligned with my life's explorative drive. That’s why there’s a second – and the beginnings of a third – poetry book manuscript in the works. Certain recent health challenges have honed things down significantly, simplified things, as such challenges often do. I find there’s very little that truly matters. It’s from this fresh and sparser sensibility that I hope to approach future writing and manuscripts. At least, that’s where my compass points.